Hydrate your tired eyes, reduce eye bags & puffiness and diminish those dark circles with our specially formulated weightless peptide eye gel. Key natural ingredients; licorice, aloe vera, cucumber distillate & MSM make this formula a super power eye gel, giving you the appearance of younger and tighter looking skin around your eyes in no time. Ingredients: Deionized Water, Organic Aloe, Cucumber Hydrosol, Organic Jojoba Oil, Plant Based Hyaluronic Acid Extract, Hydroxyethyl Ethylcellulose, Carrageenan, Dimethyl Sulfone (MSM), Sodium Lactate, Arginine, Aspartic Acid, Glycine, Alanine, Serine, Valine, Proline, Threonine, Isoleucine, Histidine, Phenylalanine, Organic Periwinkle Extract, Licorice Extract, Vitamin E, Sodium Benzoate, Potassium Sorbate, Sodium PCA, Ethylhexylglycerin, Pink Grapefruit Peel Oil, Bergamot Oil. 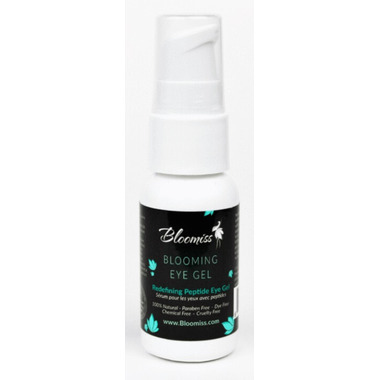 I've been using Bloomis eye gel for about 5 weeks now and it's become a standard part of my morning and evening routine. It's light, gel texture applies easily and works well under makeup. It's refreshing and I noticed a difference in the puffiness under my eyes when I use it. This isn't a lasting effect, but it's better that anything else I've tried and the price is reasonable. Also, not at all irritating and not scent. Great product! I'll buy it again.